I do find some of the descriptions of food slighty amusing and some cooking methods and suggestions are a bit unusual, for example in this chapter it suggests cooking rice in orange juice for extra flavour!! Don’t really fancy that at all. So tonight I opted for this to have with some chicken.. I only had brown rice, so just assumed that would need longer cooking. 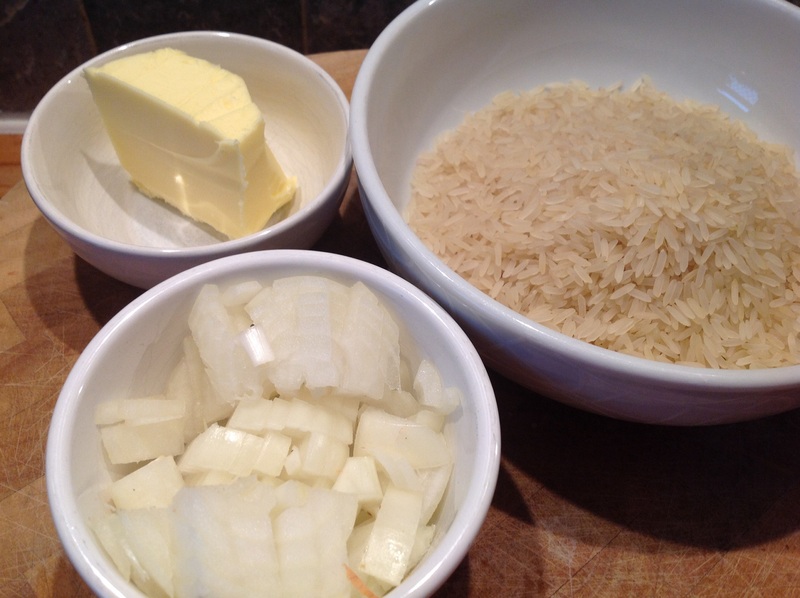 I also only had sultanas and I opted to use almonds..
First the onion is cooked in the butter and then the rice is added.. The curry powder I have is mild so I decided to had a bit more, probably a whole teaspoon.. The stock was added, not sure why it specifically states it should be from a cube though! 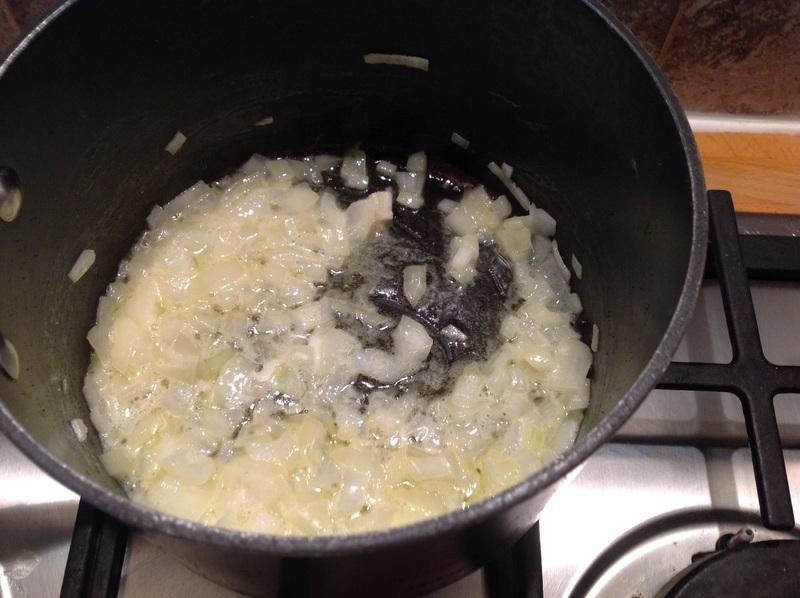 Then it’s left to simmer. So because I was using brown rice I had it simmering for almost 30 minutes and did have to add a little extra water as it had all been absorbed before the rice was soft enough. 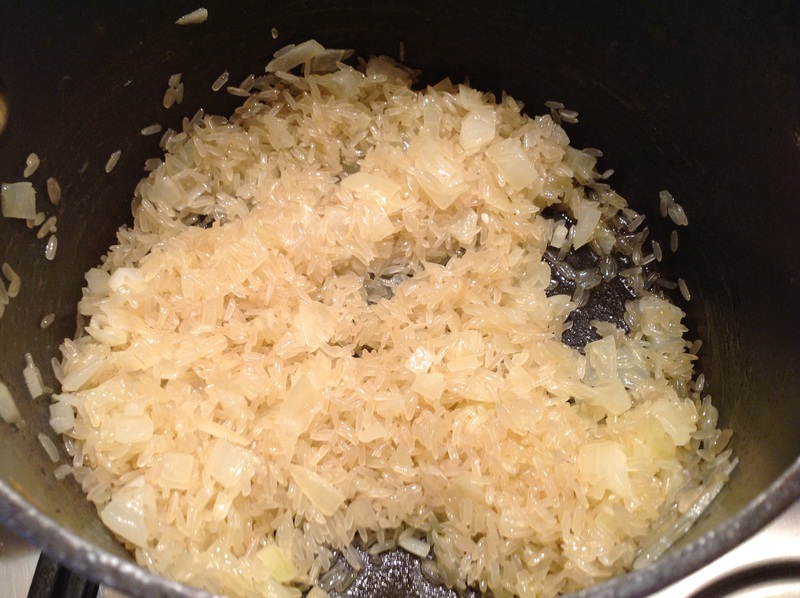 While that was simmering I browned some almonds.. They were mixed in with the rice.. So this was served with some pan fried chicken..
I’m getting used to having sultanas in curry style dishes from this book now and I do quite like it! The almonds add a nice crunch but I do think it needs much more curry powder and some fresh coriander would be good. Well first off I thought this was a spelling mistake, but there is a comment at the start of the pasta chapter that says canneroni is often wrongly called canneloni! I didn’t think this was correct and then I found out the canneroni is actually a shorter version of canneloni! So I could only find regular length canneloni and used that.. I do make canneloni now and again and either filled with spinach and ricotta or beef, this version is filled with bread and bacon! A carb filled with more carbs!! The packet of canneloni does say there is no need to precook but can be given a few minutes in boiling water if need be. 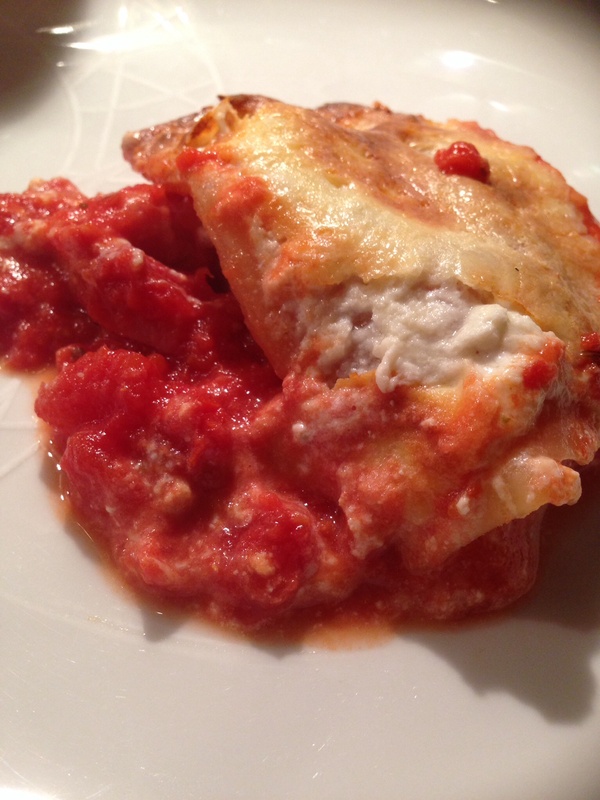 I decided to give it a few minutes so that if I wanted I could cut my canneloni into canneroni!! I have to say it does make it a bit unmanageable, a lot of them tore after only 3 minutes in the water..
All mixed with the milk, parsley and an egg..
As the canneroni/canneloni is being layered I used a slighty deeper dish than I normally use for this. So I filled up the first half of the pasta and cut a few in half..
Then half the cheese goes on top followed by more stuffed canneroni/canneloni.. This took way longer than 20 minutes before it looked ready, was more like 45 minutes.. So this is essentially pasta, filled with bread and covered in soup and cheese! Sounds pretty good to me!! So this would never be considered as high class cooking but we loved it and sometimes food like this is just what you need! I think it’s also a very good family meal for kids, my daughter loved this. 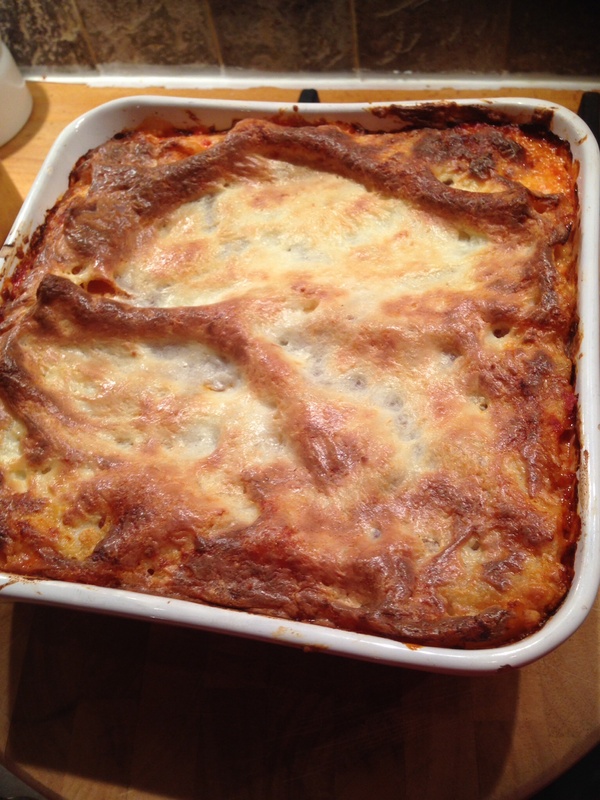 The filling is nice although all just a bit soft, but we will be having this again for tea tomorrow and I can’t wait! Would I make it again? Yes! 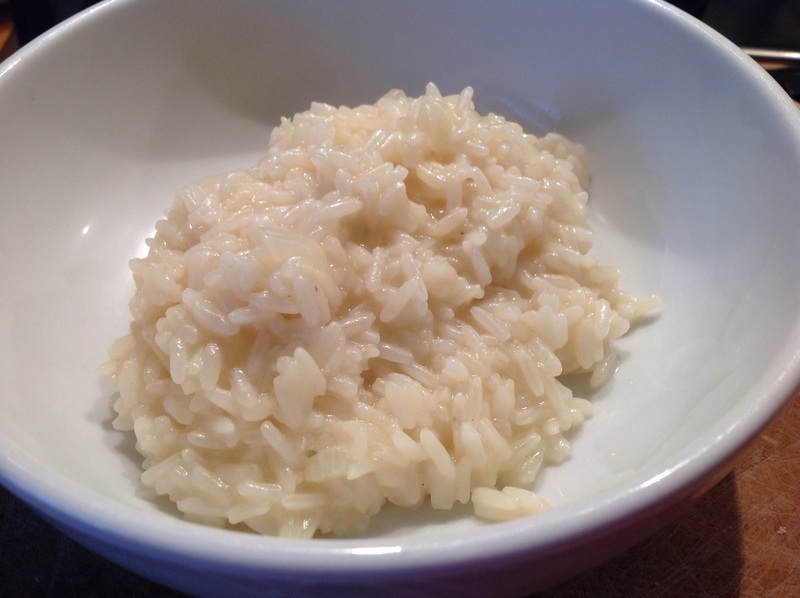 I do have arborio risotto rice in the cupboard and would ordinarily use that, but I’m quite interested to see how this works with regular long grain rice..
First off I think this is a ridiculous amount of butter.. 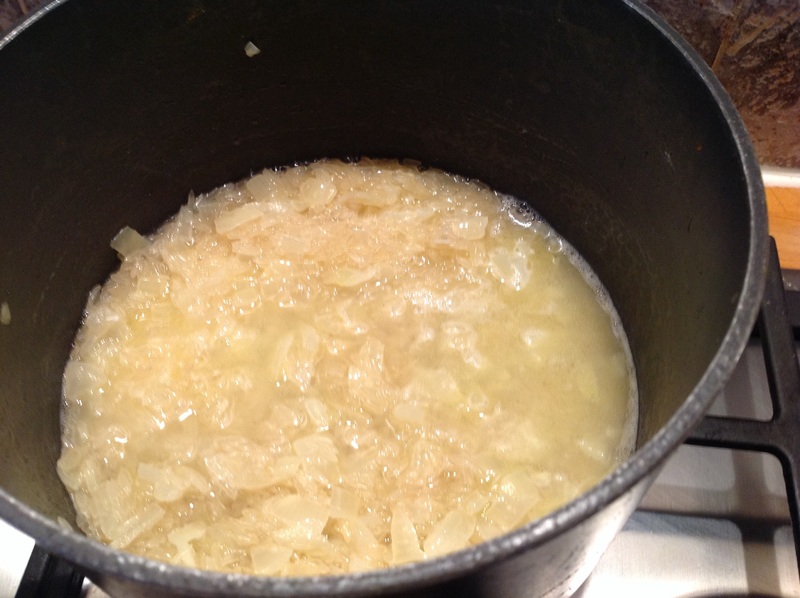 So I cooked the onion in an obscene amount of butter..
Then I added the rice..
Next I poured over the wine and left to bubble off before starting with the stock..
After about 20 minutes of simmering and all the stock had been added it was actually looking pretty good, really nice and creamy.. I rather reluctantly added the rest of the butter, but opted to serve the cheese on the side.. So I was omitting the beef marrow and saffron because I didn’t have either, kind of not sure how I feel about cooking or eating bone marrow anyway! 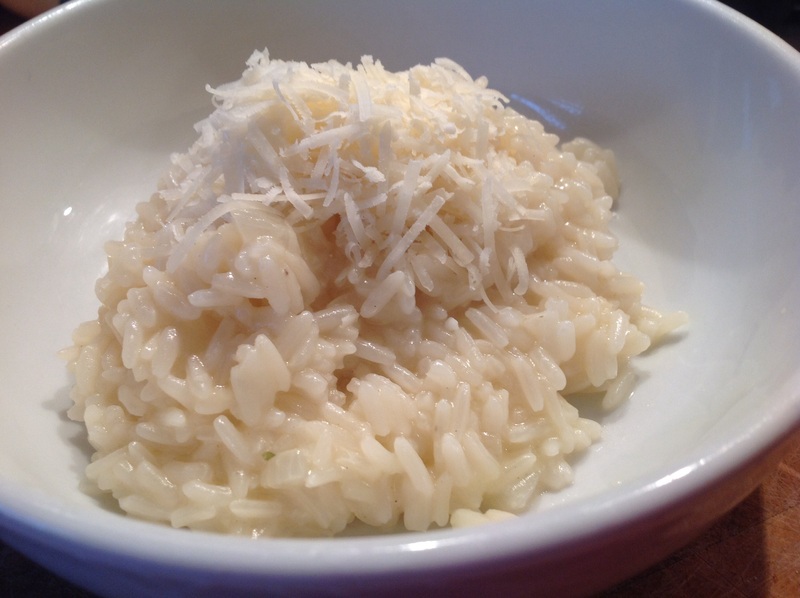 So technically this is a risotto bianco! Well I loved this! I could’ve quite happily eaten the entire pot! 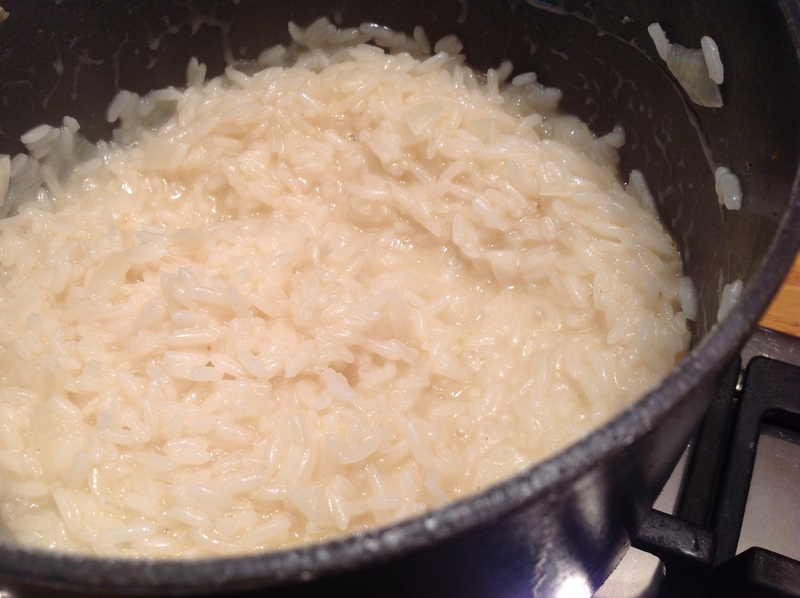 The rice is lovely and soft and is a wonderfully comforting dinner! 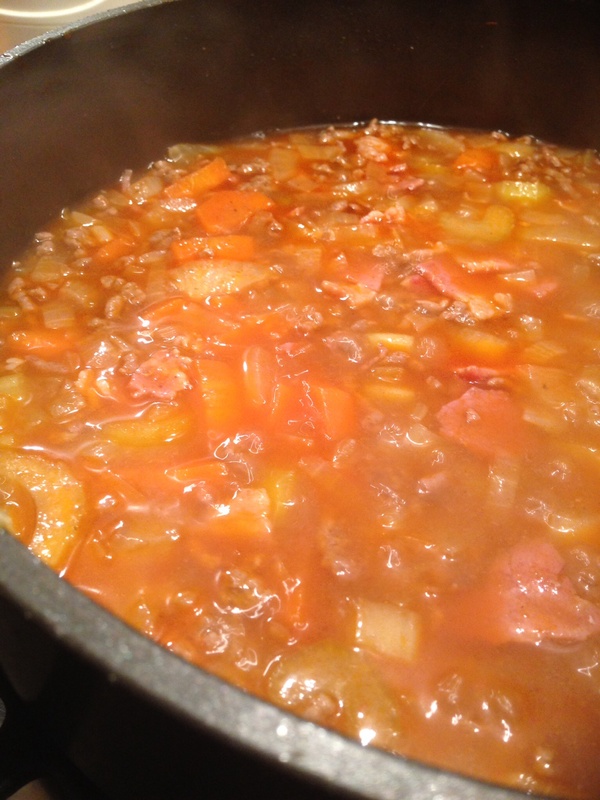 I’d consider trying it with the saffron but I like how this is really simple with basic ingredients and tastes great. Would I make this again? Most definitely.. 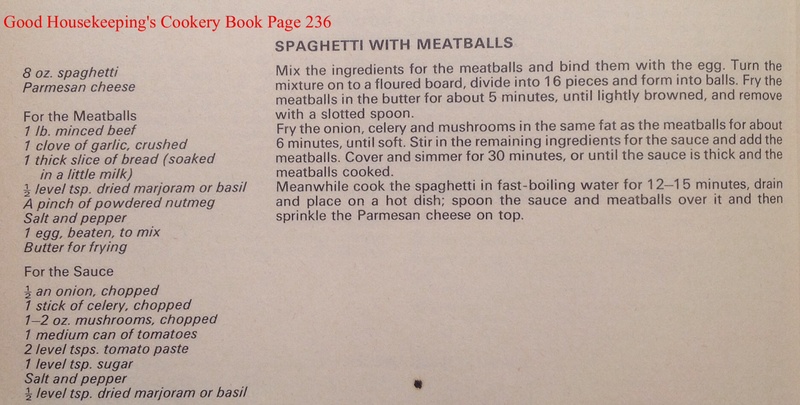 I can’t really imagine this kind of dish being eaten in the late forties, possibly the late sixties when my edition of the book was written. 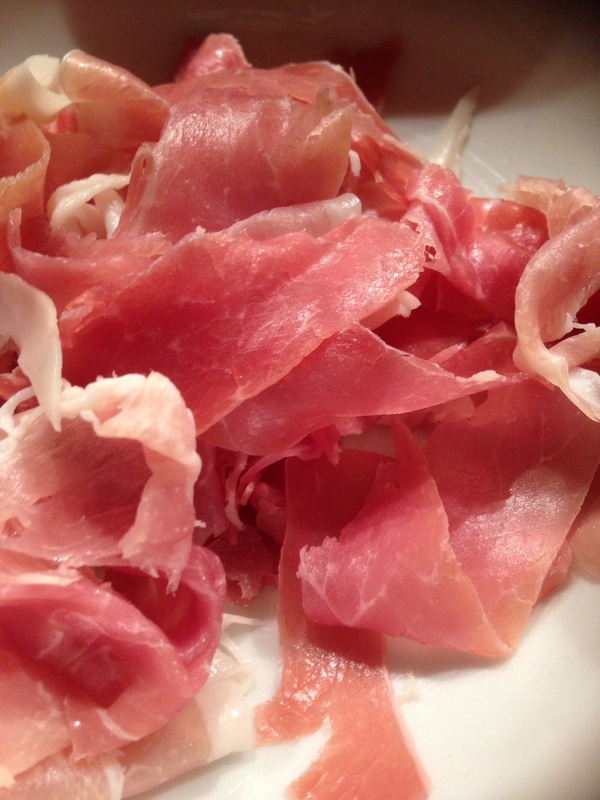 I do love prosciutto so like the sound of this! Not much to say about the cooking of this. 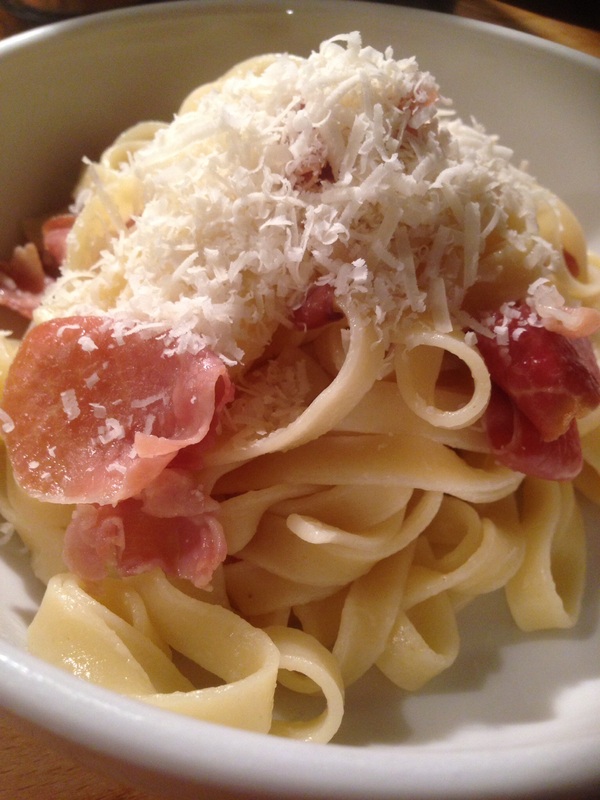 Once the pasta was on I tore up the prosciutto rather than chop, I couldn’t help but try a couple bits just to make sure it was ok! 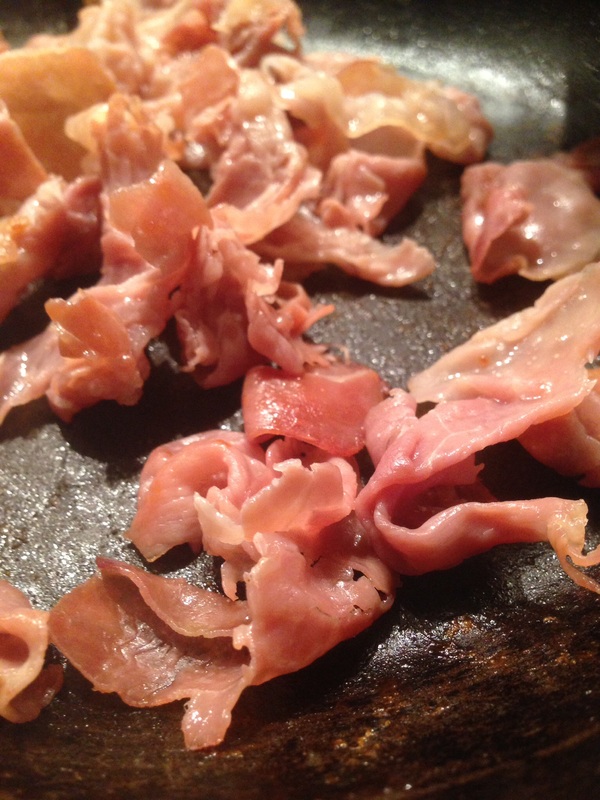 I wasn’t sure if the idea is to make the prosciutto crispy or not. After 2 minutes it was starting to crisp up in places and was thinking it was looking rather good – my photo doesn’t quite show that!! 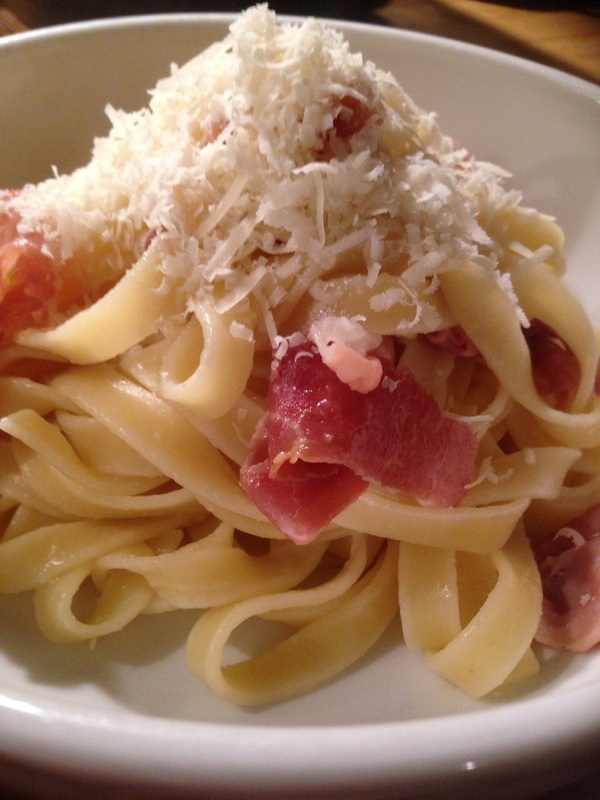 So that’s it really, the pasta is then drained then mixed with just a little butter and the prosciutto..
Then it was topped with a good handful of Parmesan..
As a dinner this is super quick and very little effort, but for maximum flavour. Sometimes it’s simple things like this can just perfect. 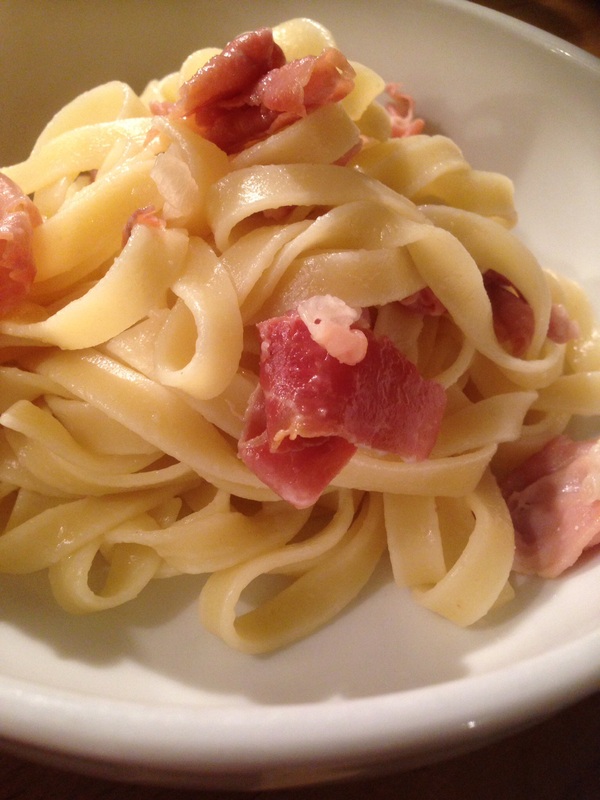 We loved this, it’s so simple but so tasty! 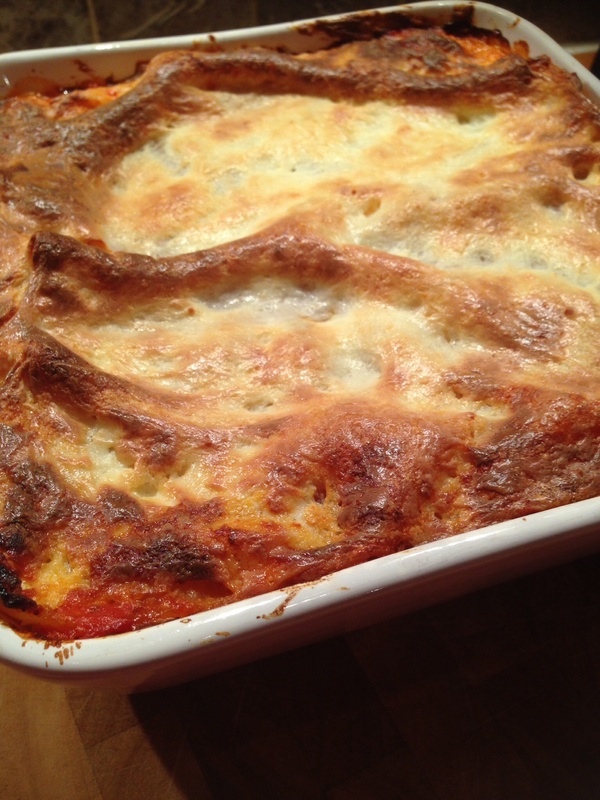 I think lasagne is probably my all time favourite comfort food! My mum makes an amazing one with two different types of mince and chicken livers and it cooks for hours. So this is a tad different. I still have some ham leftover so was using that to make this.. 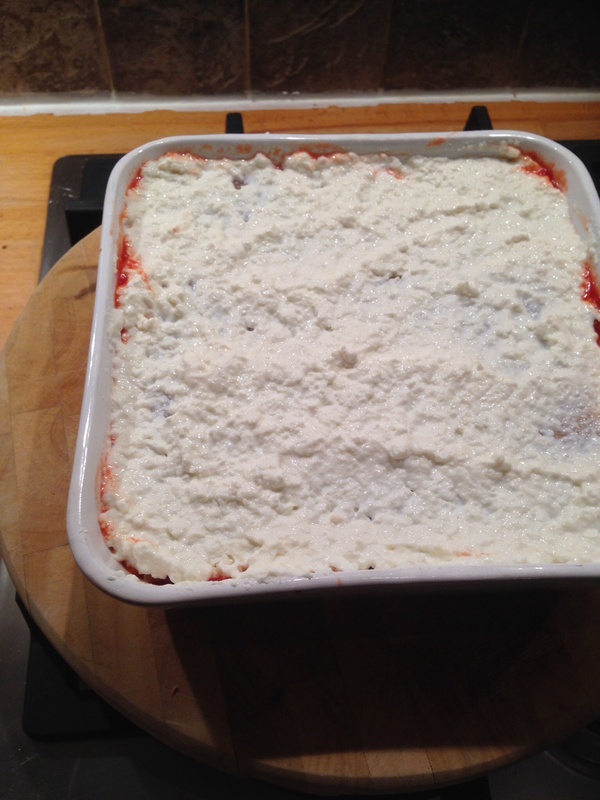 Normally you’d expect lasagne to have a ragu and then a white sauce, this has neither really. Also it’s usually beef mince I make my lasagne with, and the foot of the recipe does say to use a bolognese sauce but I did think the choice of cooked veal or ham was unusual. 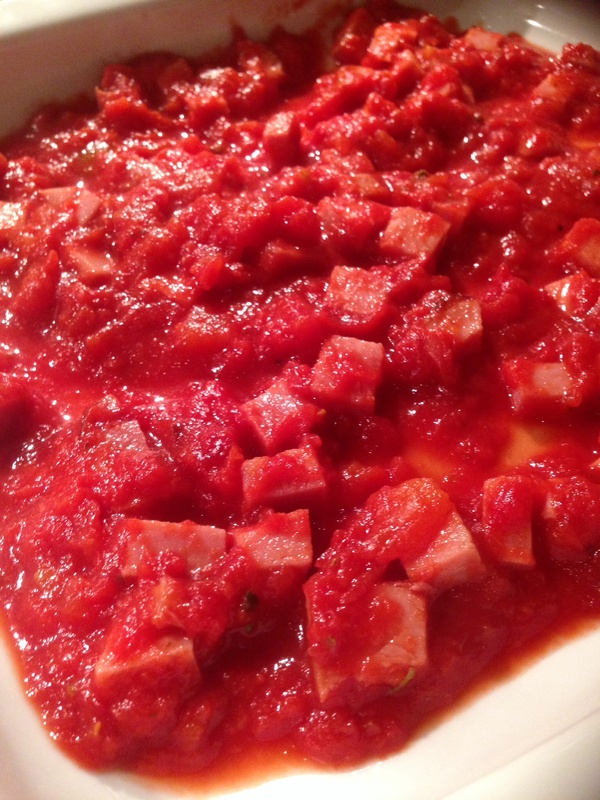 Anyway I started with the tomato sauce. I didn’t have marjoram on its own but did have mixed herbs so used that instead. 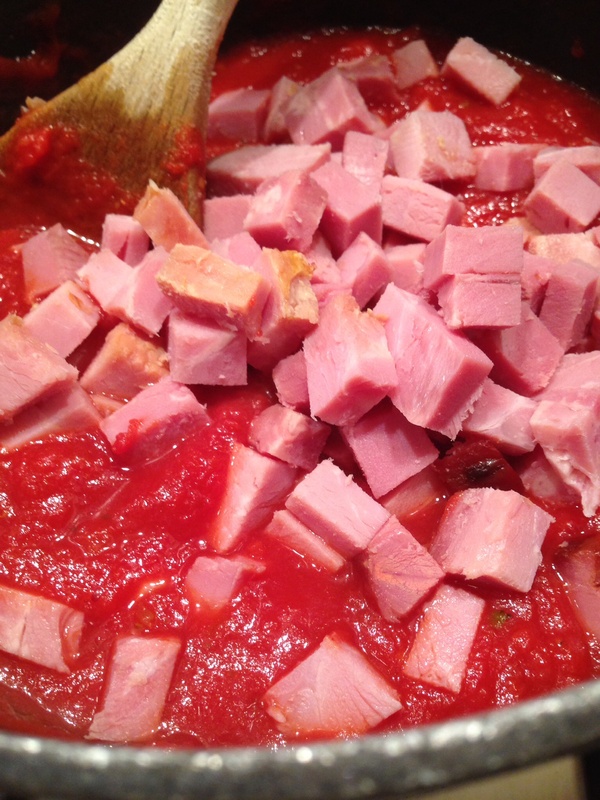 Then I added the diced up ham I had left from Monday night.. 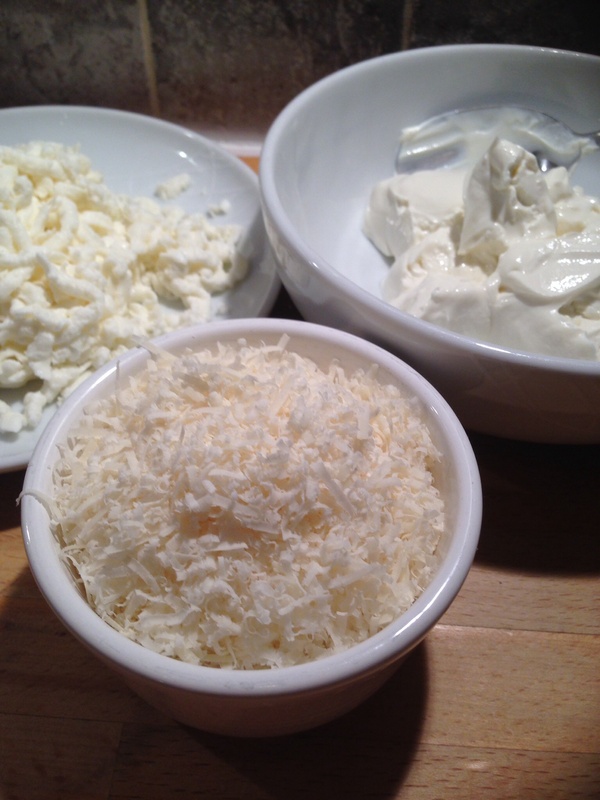 I opted to use cream cheese, and I grated the Parmesan and mozzarella. I couldn’t decide if I should be adding them as three layers but didn’t think it would stretch to that so I mixed the cheeses altogether and started to layer it up. 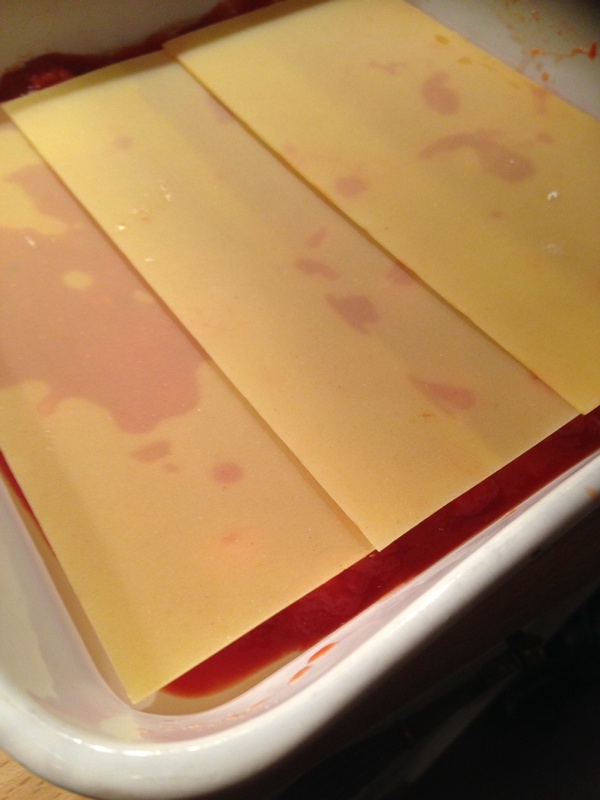 I didn’t bother cooking the lasagne sheets as the packet says not to. The cheesy layer looks a bit like cottage cheese and not that appealing! Hoping once it’s cooked it will look better. I think I had this cooking for nearer 40 minutes before the top was golden brown enough for me.. It didn’t slice up too well, I think the sauce is a it wet and ended up looking a bit sloppy on the plate.. So how did it taste? It is actually pretty good! The sauce is obviously really tomatoey and I do think it’s let down by not having any garlic or onions or having the meat cooked in the sauce. The cheesy bits on the pasta are great, yet I do think it would’ve been enough to have just the one cheese layer on top and then a proper thick white sauce for the layers. Overall though it’s a good lasagne and maybe considering when this book was written it’s actually quite an advanced recipe with really modern ingredients! Would I make this again? Yes maybe with a few alterations but it’s still not a patch on the lasagne my mum makes!! 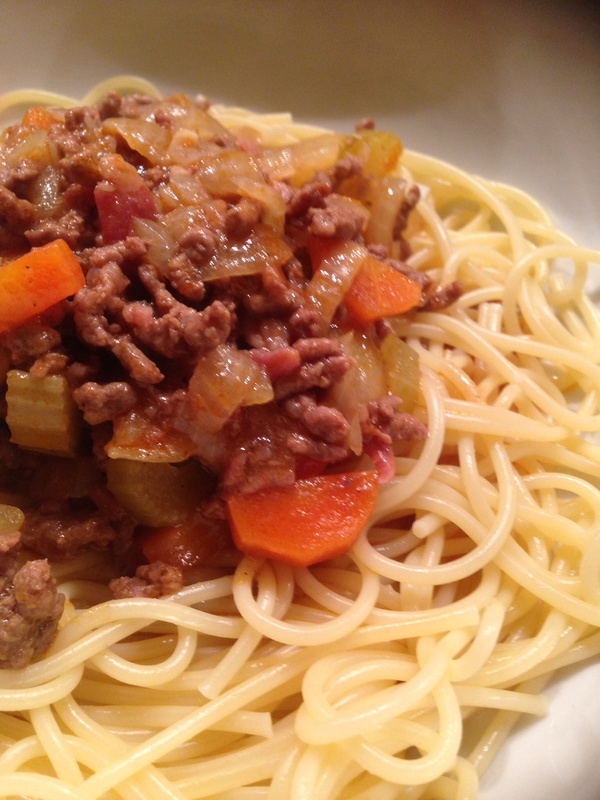 According to this recipe this is made using a traditional Italian meat sauce, well I don’t think this is anything like a traditional Italian meat sauce! For that I’d expect garlic, red wine, more tomatoes and oregano! 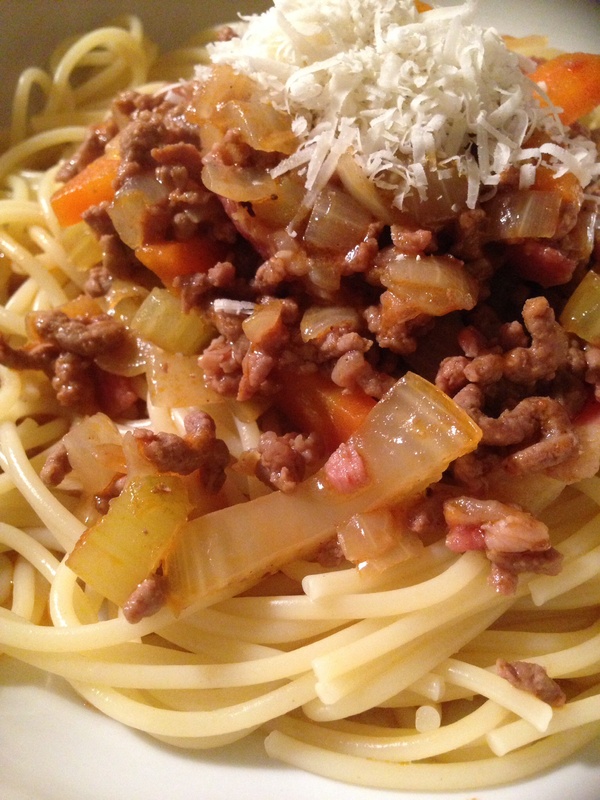 Anyway we love bolognese in this house so was looking forward to this.. I had fully intended to put the chicken livers in this but was so disappointed when I went to get some from the butcher today and they didn’t have any! Again I don’t know how traditional it is to have chicken livers in bolognese but my mum makes this amazing lasagne with chicken livers and I really think it makes a difference, I think they add an extra rich meatiness! I didn’t have time to try elsewhere so had to leave out. I actually didn’t cook this, husband and daughter were left in charge of this one! So I don’t have many photos of the cooking process while they were in charge of the kitchen! Once everything is chopped it’s all pretty much left to simmer..
After 30 minutes the liquid had reduced and everything looked nicely cooked..
It’s not the dark rich tomatoey colour you’d expect from a bolognese..
We served with plenty of Parmesan on the table..
Well I don’t think this is like a bolognese! It’s is really tasty and between the three of us we ate the entire lot! I really would like to try this with the chicken livers. 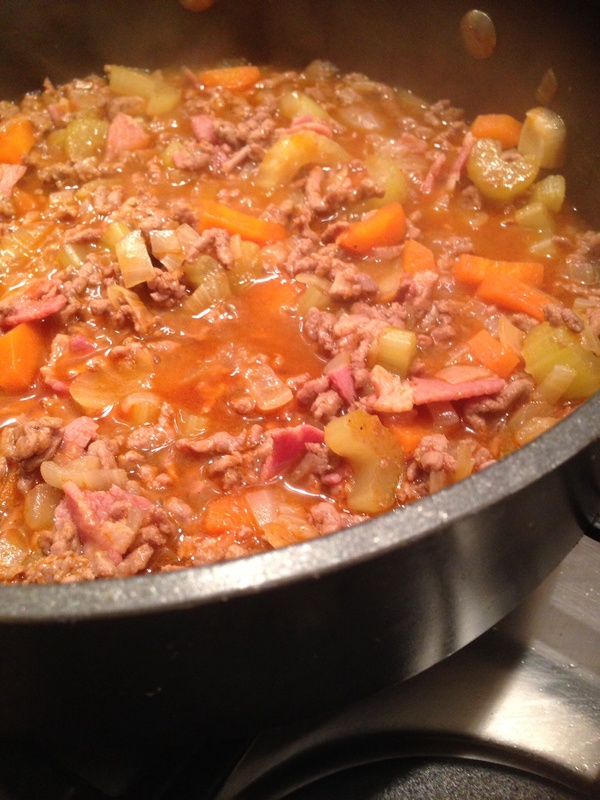 I also don’t often put carrots or celery in bolognese but I suppose that’s a good way to pack in extra veg for fussy kids! Would I make this again? Yes, adding the chicken livers! This is quite a popular dinner in this house, and I do make this a lot but I never use a recipe! 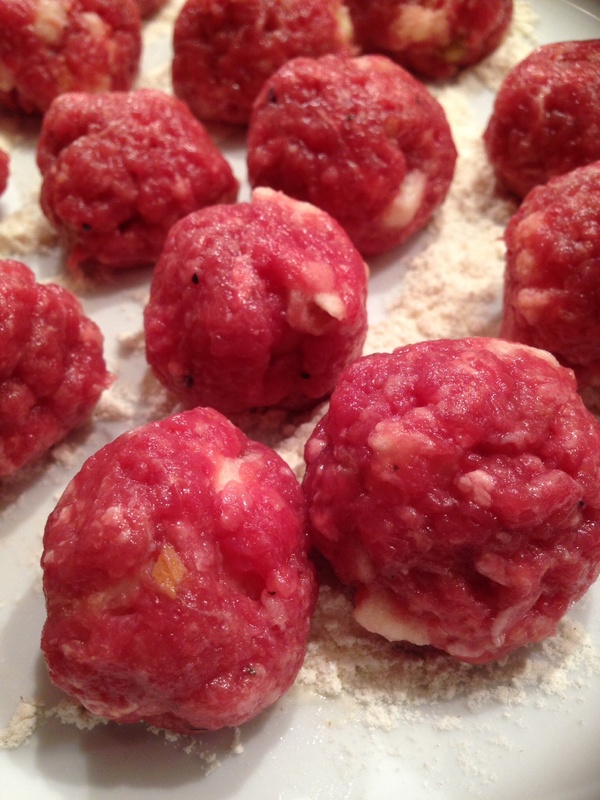 My meatballs tend to just be mince and seasoning, I very rarely add anything else. 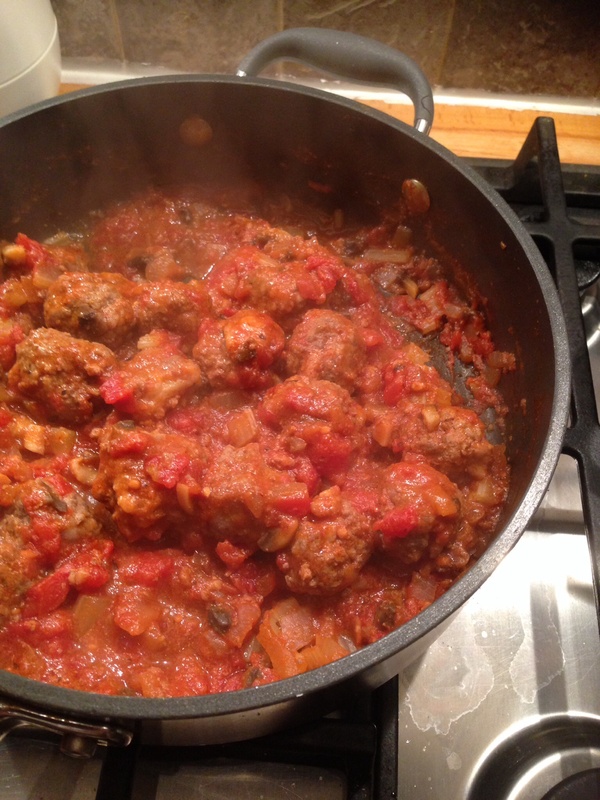 So these meatballs seemed like more of a faff than my usual efforts! 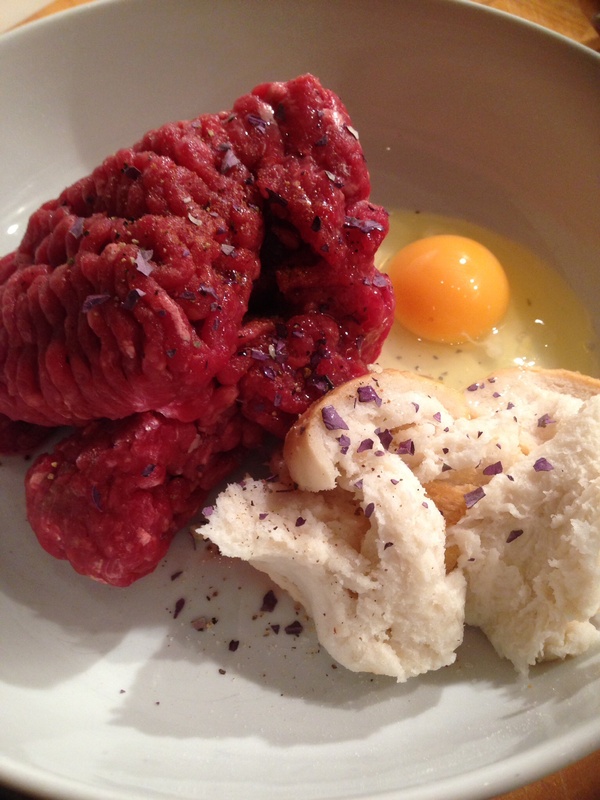 I started mixing the meatball ingredients and was thinking I should’ve removed the crusts from the bread! I also used dried basil but for some reason I only had the purple variety! 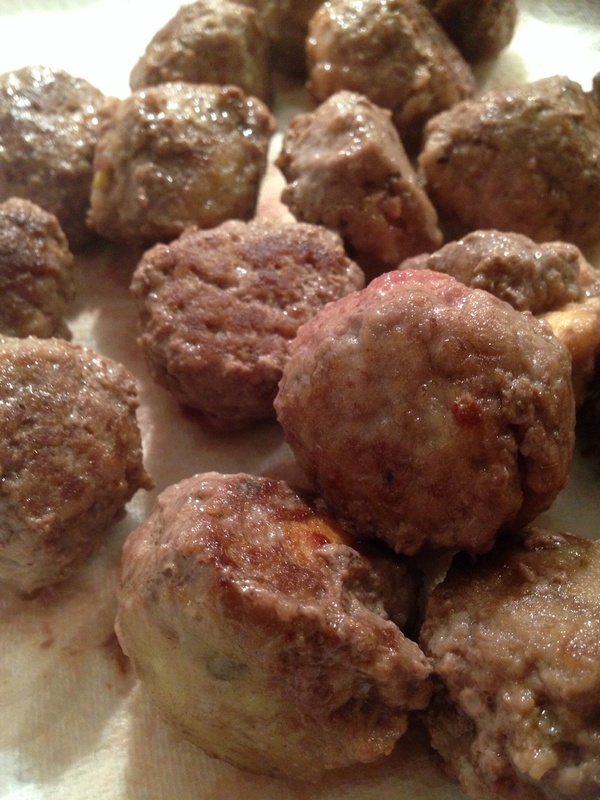 I didn’t count my meatballs and wasn’t particularly uniform about shaping them.. So these were fried for about 7 minutes while I chopped the veg for the sauce..
Then it was on with the sauce. 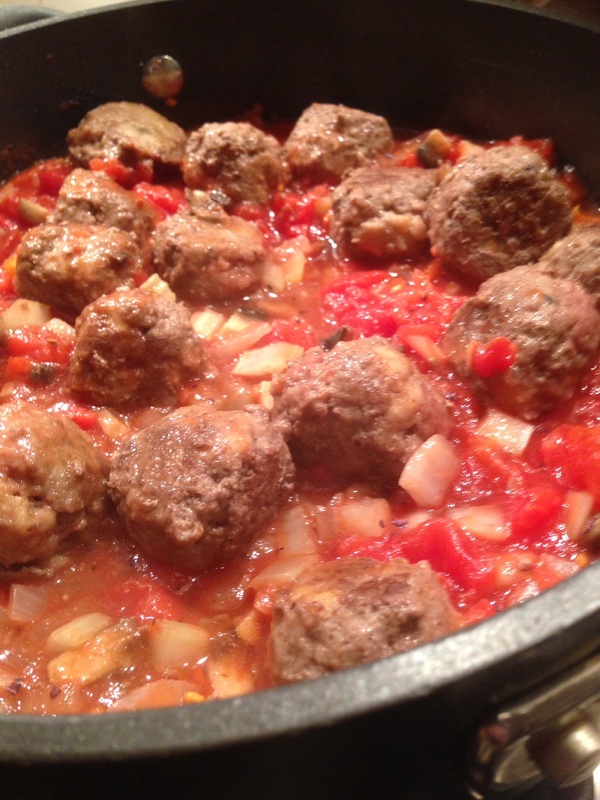 When I usually make meatball sauce I tend to blitz it to make it smoother. 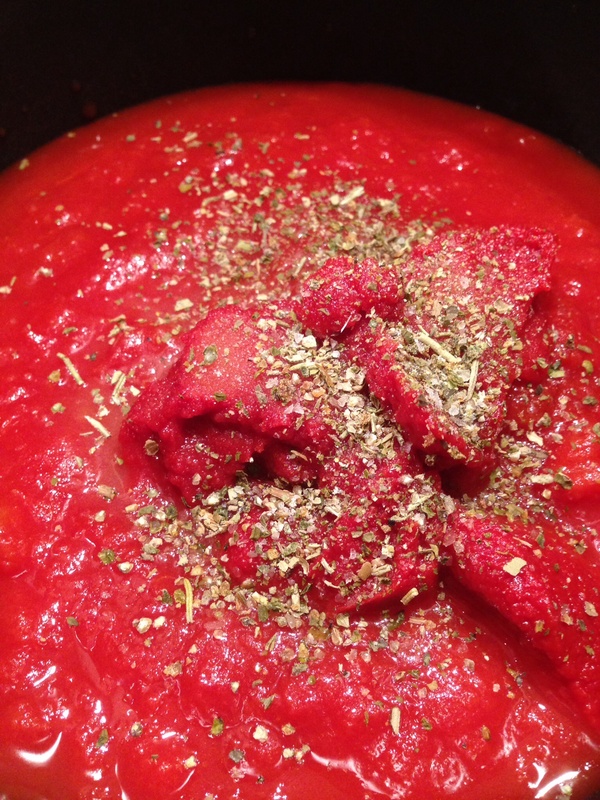 I quite like the idea of the chunks of veg in this sauce and is another good way of sneaking in extra veg for the kids..
After 30 minutes the sauce really had thickened up and the meatballs were nicely cooked.. 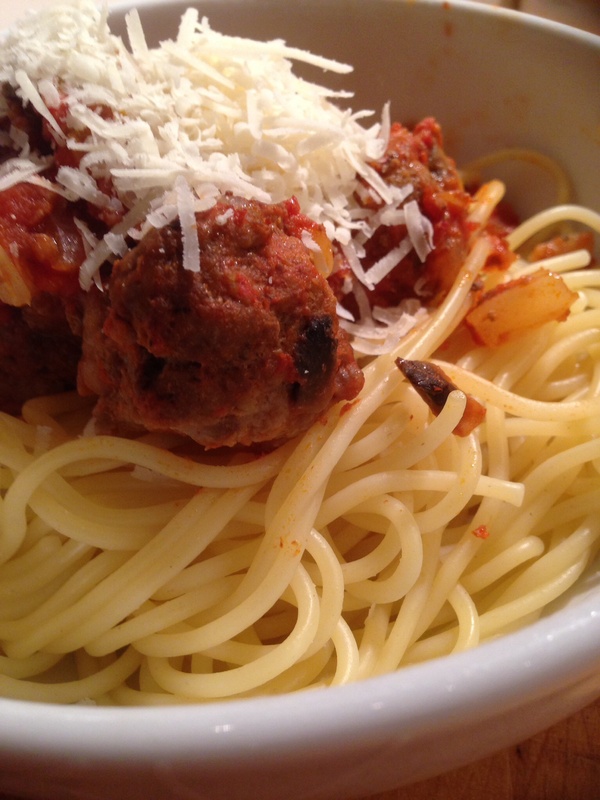 I was making this for 2 adults and 2 kids so I used the whole 8oz of recommended spaghetti. 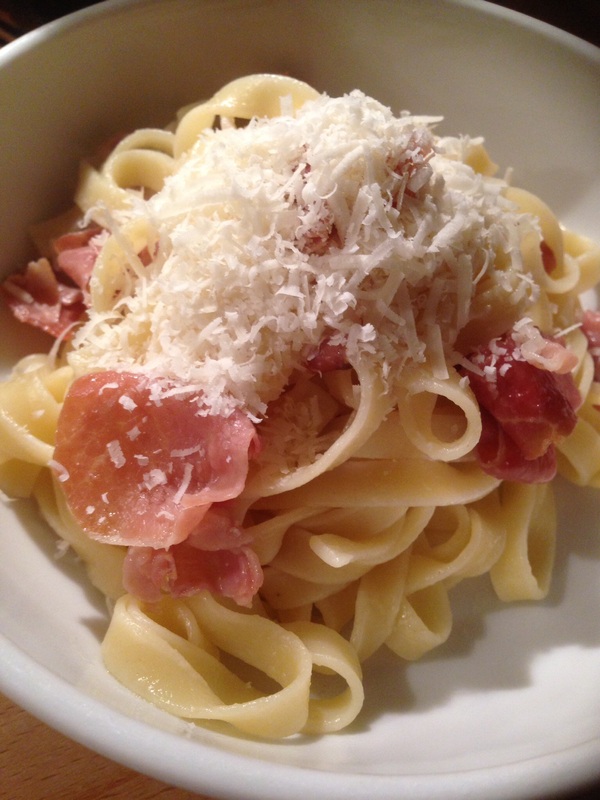 In other pasta recipes I felt the quantities were a little sparse! In this case all this was the perfect amount for the four of us.. Finally it was served with Parmesan on top and a little extra on the table..
Well as spaghetti and meatballs go this is rather good!! 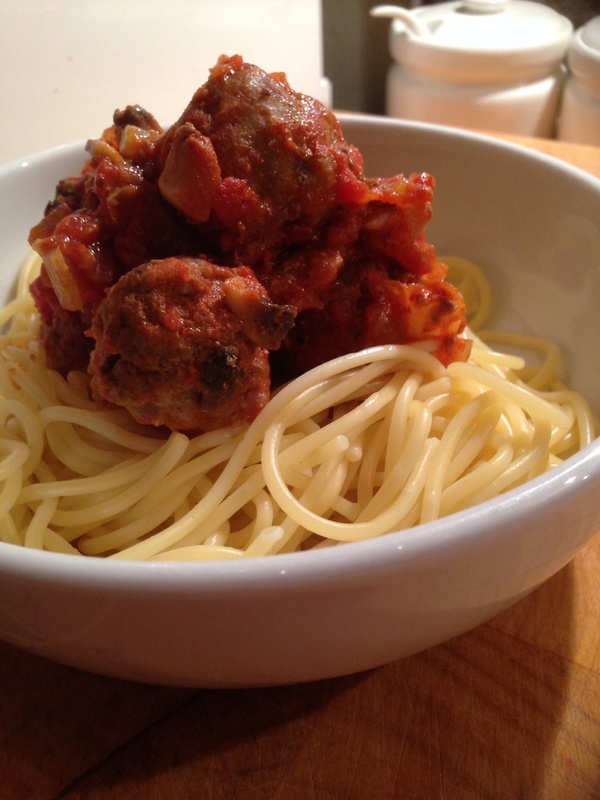 The sauce is great as are the meatballs. I think the egg and bread are used to bind together but when I make mine without them they do work just as well. I suppose adding the bread helps bulk up the quantity and serve more. Overall this was a great recipe and clean plates all round!